John Hagel posts some interesting comments about Disney, Pixar and Jobs. He is sceptical about the strategic contribution that Steve Jobs may be able to make to Disney. This is essentially an argument for a relational strategy in response to asymmetric demand. Hagel argues that “scale and scope economies in the media business are migrating away from products”. This may be true for most media companies, but many people may wonder whether it really applies to Disney/Pixar? How asymmetric is the demand for the latest cartoon film? Surely these cartoons are always going to remain mass market products, long after other media products and services have been fragmented and customized? Of course it’s not as simple as that. Consider the increasing complexity of the cartoon whole-product. Besides the film itself, we are urged to consume the music, the computer games, the ringtones, the toys, even the books. Cartoon characters are printed on breakfast cereal packets, and given away by fast food outlets. Thus there is a considerable ecosystem of commercial exploitation. One of the strategic issues for Disney/Pixar is the delicate balance between narrow control of the brand (ultimately how the cartoon characters are experienced around the world) and broad encouragement of creativity and innovation within the brand. This is perhaps not so very different from the challenges that Steve Jobs faced at Apple. John Hagel is critical of Apple, and attributes Apple’s commercial failure to Jobs’ thinking of the computer as a product rather than as a platform. So how do we interpret Apple’s recent success with iPod and iTunes? Surely these are successful platforms, not just products. Look at the explosion of new practices (such as podcasting) that these platforms support. But there is a critical difference between the product/platform shift (which is a response to the second asymmetry) and the positional/relational shift (which is a response to the third asymmetry). Can Disney / Pixar / Apple ignore the third asymmetry – and for how long? Various people talking about the dispute between Google and the US Department of Justice (DoJ). Boing Boing, Search Engine Watch, Emergent Chaos, Graham Shevlin. One line of discussion relates to privacy. Some commentators are praising Google for resisting the US Government’s demands for data, when its competitors have apparently complied. So the DoJ is hoping to solve a complex problem with very large amounts of data? Does it really make sense for the DoJ to copy the raw data from Google onto its own processors? In a service-oriented grid-enabled world, it would seem to make more sense (and raise fewer privacy concerns as well) for the DoJ to collaborate with Google (and its competitors) – to compose intelligent and relevant analytical enquiries that can be run by Google (as a service, albeit commandeered by the Government) to help solve the DoJ’s problem. Of course Google is an interested party in the outcome of the DoJ’s deliberations, but does engaging it as a trusted partner in the analysis really increase its ability to bias the outcome in a self-interested way? And if it provides knowledge and metadata services rather than raw data, this might mitigate the threat to its position as a trusted custodian of personal search records? On the Longtail blog, Chris Anderson produces some data that he interprets as evidence for The Decade the Blockbuster Died. Many comments (including mine) suggest alternative interpretations of this evidence. An album (or film or other entertainment product) may achieve massive volumes when it is first released, or it may become a perennial best-seller. In theory, there are two routes to long-term success, so that a slowburning quality product might achieve parity with a flash-in-the-pan popular hit. But in practice, products are deleted from the catalogue or become effectively unavailable – either because the sales volumes falls below some threshold defined by economies of scale, or because of some arbitrary decision by the record company (such as a dispute with the artist). In the former case, such thresholds assume an economics based on there being a symmetry between the supply model and the levels of demand directly addressable by it. So the statistics cited on the Longtail blog don’t reflect the “pure” behaviour of the market but reveal the distortions caused by the behaviour of the record companies. This is an example of large companies imposing arbitrary restrictions to suppress the longtail. In recent years, the internet has apparently provided opportunities for record companies to exploit the back catalogue more effectively, but there are still many classic records and films that are not available in the latest formats. Pundits or rigged elections produce lists of the 100 greatest products in various categories (special thanks to Channel Four) and this promotes sales of these older products. But the market remains distorted, and the evidence for the longtail remains patchy. Similar considerations apply in the pharmaceutical industry. But in the same way, a business model reliant on blockbuster drugs is looking increasingly problematic, while the industry has not yet made a satisfactory transition to the longtail. The strategic challenges in these (and other) industries can be understood in terms of meeting the challenge of asymmetries of demand, and the need, therefore, for a business model that can use a micro-segmentation of demand to address the needs of customers one-by-one. Charlie, Picking up on your question about the SUV and health club examples in your last blog The Impact of Differences in Context, you base your comments on seeing Asymmetry 1 in there being a diversity of technologies, Asymmetry 2 in there being a diversity of business models, and Asymmetry 3 in there being a diversity of contexts of use. This is not quite right, because for us Asymmetry 1 is about managing the relation to a diversity of uses of technology, and Asymmetry 2 is about managing the relation to a diversity of solutions. An SUV is a vehicle that incorporates a compromise (design trade-off) between lots of conflicting technologies in how they can be used. The relationship to demand is one where the supplier offers a product that supports particular forms of use by the customer. It is the nature of this relationship to demand that makes it an illustration of managing the first asymmetry. In an ideal world, my family would have a selection of cars for use in different contexts – long-distance versus short distance, carload of muddy children versus business trip, camping equipment versus week’s groceries, perhaps an open-top car for the summer. In practice, we have a single car that has to be capable of being used for as many different purposes as possible. As it happens, we have a Land Rover. This is good enough for most purposes, although there are undoubtedly better and cheaper cars for each purpose taken separately. The point, however, is that it is we who manage the second asymmetry by deciding how we are going to use the car in order to provide ourselves with a solution that is fit-for-purpose. This contrasts with the last time I needed to move some furniture, which necessitated hiring a van from a rental company. Here it was a solution I bought – not the van itself. It also contrasts with the solution to keeping my car road-worthy, which I buy from my local garage (at vast expense!). These last two are illustrations of managing Asymmetry 2 – what distinguishes them is again the nature of the relationship to demand, and not the business model per se. In my view, there are basically two business models used by car manufacturers, both of which are managing Asymmetry 1. One is to be the best-in-class or best-value-in-class for a highly specialized use – e.g. sports cars (Ferrari versus Porsche) or town cars (Smart versus Mini). The other is to possess a decent cluster of features so that it can be used as a reasonable compromise solution by a sufficient number of people who want a multi-purpose car. While there are indeed some Land Rover and Jeep models that are specialized to off-road purposes, most civilian Land Rover and Jeep sales are for the mixed-use models. The cluster of features is a mixed benefit. Much of the time I am bearing the cost of features that I am not using. 4-wheel drive incurs a higher cost of ownership than 2-wheel drive. This is economically inefficient, and I only bear this economic cost because the transaction cost of switching cars would be much greater. This is the issue that you address in your paper on Value-driven architecture: architecture determines the ways in which the trade-offs between a cluster of features can benefit the user. When I change my lifestyle (for example, having children), my way of extracting value from the available solutions changes. Perhaps I make less use of the off-road features, and higher use of the safety features. But if I have chosen a car that is strongly adapted to my childless lifestyle, the chances are that this car is less well-adapted to my altered lifestyle. This may mean that I face a significant value deficit – linked with the limited adaptability of my car, and the cost and inconvenience of changing it. This change in my lifestyle is certainly a change in me and my family as a context of use, but again, it is again for me to manage the asymmetry that it opens up. Rather than investing in my own gym, the health club enables me to buy a number of solutions. The way it manages the relation to these solutions is a good illustration of managing the second asymmetry. Most members only use a subset of the facilities, so they are paying for solutions they never use. Indeed, some of the facilities supporting these solutions may be very infrequently used, and so represent an economic burden on all members. So one of the challenges facing the Health Club is how to maintain an alignment between the facilities available and the solutions that it is offering in response to the demands of its members. But given that a large city has some number of health clubs, each with a different set of facilities being offered to different sets of members, how might we end up with an efficient distribution of facilities? The two obvious answers – central planning and market forces – both appear to “solve” this problem in a different way, the former by rationing facilities, and the latter by leaving it to the business to manage the trade-off between risk and reward resulting from their particular way of offering solutions in response to members’ demands. For the former to work, the form of demand has to be entirely static. As demand becomes more dynamic, the latter doesn’t work either because it is using feedback loops that are responding to aggregate rather than to particular changes in demand, and can therefore never catch up with the full dynamic complexity of the situation. So what I’m focusing on here is the tension between economic efficiency (adaptation) and sustainable (dynamic) adaptability. In the SUV example, the car manufacturer is not itself managing the adaptability, leaving this to the customer; while in the health club example it is. In neither case, however, is the business addressing the third asymmetry, which is left wholly to the customer’s own ingenuity. How radical is this critique? 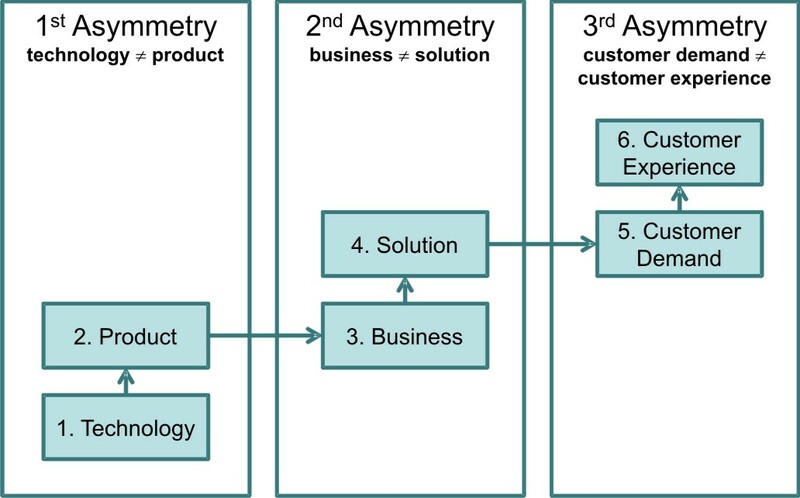 If we try to envision a business that uses cars but in which the third asymmetry begins to be managed through dynamic collaborative composition within a particular user’s context-of-use, it would have the ability to respond to individual demands in the same way (for example) that the NetJets business seeks to satisfy unique travel profiles for its client businesses. Thus what we are particularly keen on is finding ways in which some added value can be released for a business by tackling some aspects of the third asymmetry incrementally. There are some significant opportunities for SOA to deliver additional value and adaptability to the end-user. The obstacles are not primarily technological – although there are a few fascinating technical challenges – but organizational. Suppliers generally don’t have the mindset to view these opportunities favorably – they appear to incur a significant cost and risk, not to mention complexity, without delivering much supply-side value. You write: “A supplier wants to be prepared for whatever the consumers might need in whatever context they find themselves in.” In our work with clients, we are experiencing some ambivalence (at best) about this ‘want’. Is it an idle ‘want’, which suppliers are happy to subscribe to as long as it is easy? Or is it a serious and committed ‘want’? And where is it located in the organization? Our answer is that it is located at the edges of the organization! This is why “power-to-the-edge” is so important – as an organizational change first and foremost, but with a significant contribution to be made by SOA and related technologies to give the organization the agility it needs to respond cost-effectively at the edge.